A bell built into a handlebar grip. For use on the left side of your handlebars. Comes with a matching handlebar grip for the right. 15 cm long. 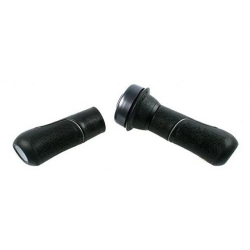 Both grips are quality items secured with a bolt to prevent turning on the handlebars. When tested, this bell was measured at 98 dBA at a one metre distance.